The Gray Report: Wine does not go with chocolate! How can every food magazine and lifestyle magazine in the world be wrong? The issue is wine with chocolate. This time of year, as we approach candy producers' favorite holiday, you can see articles everywhere on the topic. Why? It's simple. Valentine's Day gives editors a theme to assign in February, which is otherwise a bleak, short month, especially for food as so few things are in season. Every wine writer has had to do a wine-with-chocolate article (yes, I've served that sentence). Many food writers also. More often, you get some general lifestyle writer who really doesn't know either well, but just knows she likes both. The point is, this is an editor's story, not a food or wine expert's story. If you pay me $1000 to write a wine with chocolate article, I'll do it, because I'm a whore freelance writer. And I know you won't pay me $1000 if I write that wine doesn't go well with chocolate, so I'll go out of my way to find a few examples that aren't terrible. My friend Sara Schneider of Sunset magazine has done just that here: This is the kind of article I would write, if you paid me. She has played the potential pairs in as positive a way as possible: Darker chocolates, sweeter wines. It's true that this is much better than a Russell Stover box and a bottle of expensive Cabernet. If you like eating squares of 70%-and-higher dark chocolate, and you have some Vin Santo sitting around, that's actually pretty good together. But she can't ask the basic question, which is this: Why pair wine with chocolate at all? Does everything you put in your mouth have to go with wine? Can't you enjoy wine with dinner, and chocolate afterward? Chocolate is not the worst of all foods with wine -- that would probably be chili peppers. But it's on the "difficult" list with artichokes, pickles, peanut butter, asparagus, Jello, etc. I could do a "wine with artichokes" article if I had to (Sauvignon Blanc), but it's unlikely I would ever do it more than once. Wine with chocolate, though, runs every year, everywhere. While I was at the San Francisco Chronicle we did a huge pairing tasting of chocolates with every wine reputedly good with chocolate: Pink sparklers, Merlot, Zinfandel, Cabernet, Port, Sherry, Vin Santo. I liked Vin Santo best of all; other than an Israeli pomegranate wine I had once, it was the best wine I've ever had with chocolate. Some of the other combos weren't offensive. But our main conclusion was that in almost every possible combo, the wine and chocolate are both better separately, and in more than half the cases they were awful together. And we were using good dark, supposedly "wine-friendly" plain chocolate -- not the filled bonbons most people eat. So why do you keep seeing these perky "Perfect Pair For Valentine's Day!" stories? It has become a self-fulfilling story: editors and unknowledgeable writers read the "wine with chocolate" article in other magazines and they just know it must be accurate. There's no money in contradicting conventional wisdom. I won't get paid for writing this unless thousands of people click on the Google ads on the right. I think I get 5 cents per click. So if 20,000 people click on the ad links, I will make as much money as if I had sold out and written another perky "wine with chocolate" article that I could cynically pound out in an hour, because the advice never changes. I must add that you also see wine and chocolate paired in tasting rooms all over Napa Valley. Why? It's simple -- after the first winery visit of the day, most people are drunk and can't taste well anyway. Chocolate is good; give 'em some chocolate and they'll buy anything. I don't blame marketers for doing whatever they can to sell their wine, but it does help propagate this fallacy. Folks, if you want to drink wine with chocolate, or artichokes, be my guest. Just know that you're being manipulated by the magazine industry. If you don't believe me, I challenge you to do this: taste the wine. Pay attention (take notes, even if just to give it a rating of excellent, very good, whatever). Now taste the chocolate. Also, pay attention to how much you like it. Now, taste the wine again. Is it better? Worse? You tell me. Chocolate truffels and zinfandel! YUM! Is the pomegranate wine you had Rimon Dessert Wine? I like the wine. It has a dark chocolate like flavor so it doesn't fight against chocolate, I think. I totally agree. Why ruin a glass of good wine with chocolate. The only think I've ever tried that kinda worked was Bonny Doon's Framboise. Hi Makiko, yes, the wine was Rimon Pomegranate Dessert Wine. Coincidentally I just tried their dry pomegranate wine -- I'm in Tel Aviv at the Israeli Wine Expo right now -- and thought it quite interesting. But the dessert wine is better, and an excellent chocolate match. Zin: To each her own. It always cracks me up when wine snobs get their territory invaded. OMG! How dare the mainstream media try to tell YOU what goes well - isn't it YOUR job to tell them?? 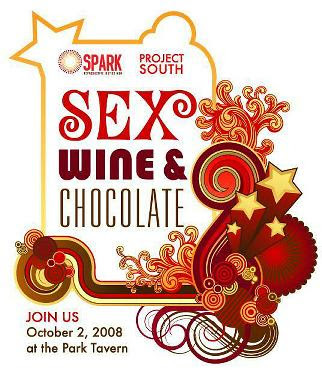 Sorry folks, but wine and carefully paired chocolate works. We all know what opinions are like, especially yours, Mr. Gray. Maybe it's just me, but I value opinions more when the person holding them isn't hiding behind anonymity. Thank you. I've never understood the appeal of wine and chocolate, but it seems to be popular. Maybe because by the time one gets to the chocolate-wine course one is too blotto to notice. If you haven't tried it, I recommend Tcho chocolates (not with wine.) I like the "citrus" the best. It's a little cool here to have at SF "room" temperature; best at "body" temperature.